From the very first time they can hold a crayon and scribble, we begin to collect our children’s artwork. Glitter pictures, drawings, hand prints, finger paintings and collages all created by our children’s hands. Before long, these wonderfully imaginative pieces of precious artwork tends to accumulate. Whether it completely covers the fridge door or fills your under-the-stairs cupboard, these pieces of kids art can get damaged. I mean, let’s face it, their artwork deserves more recognition than being displayed on the fridge. Figuring out what to do with all the creativeness can be a real challenge which is why this has always been a tough task. Here at Created by Magic we have come up with some great kids artwork display print ideas to showcase their art and suit your home! Whether you want simple and traditional or bright and geometric we have some wonderful combinations that will suit any style of decor. We find that each child has a style of creativeness that requires a unique style, which is why our showcase layouts are all so different. We can allow for their names, date of births and even a photograph. Maybe you have more than one child? 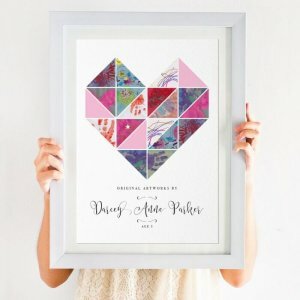 We can create a unique print to allow for two creative genius’! Simply take photographs of your favourite pieces in daylight with a quality camera of smart phone and safely store them all in a quality air tight box. Choose your ideal design from our children’s artwork display prints and send us your digital copies of their artwork. Before long, your unique personalised kids artwork display print will arrive at your door ready to take pride of place, where it belongs! All prints are printed on either a premium gloss or watercolour paper, free standard UK delivery is available on all orders.